All over the Western world, there are variations of the definition of the word “terrorist” but, at its basic, the definition is simple: “The word “terrorist” has its roots in the Latin terrere, which means “to frighten” (New York Times columnist William Safire). I don’t want to go into the history of terrorism (I have enough articles about that on my blog), but there are “waves” of terrorism. Post-Cold War (beginning with the collapse of the Berlin Wall), states have mostly dealt with “religious terrorist groups;” this shouldn’t be surprising for political observers (September 11, 2001 attacks cemented this particular “wave” of terrorism). In the last couple of decades, however, certain marginalized groups (especially irredentists) have tacitly adopted “terror” to advance their objectives—statehood. The notion of irredentism is back: The collapsed Yugoslavia was the melting pot of irredentism (brutal Yugoslav wars preceded the 2006 referendum that created an independent nation of Montenegro, and the Republic of Kosovo was formed in 2008). After 10 years, with 140k people dead and 4 million plus displaced, the former Yugoslavia was divided into seven countries—Serbia, Croatia, Bosnia and Herzegovina, Slovenia, Montenegro, Macedonia, and Kosovo. If you are going to carve Nigeria, as you have all been wishing, Yugoslavia is your perfect model, for it was ethnically and religiously divided, too (it’s wishful thinking to think that we can pray our way out of this mess—ask Israel and Palestine). Secession is an ugly affair (not a child’s play). In Yugoslavia, different groups used terrorism to achieve their objectives. By the way, the end goal of terrorism is to gain more political power, especially the power to rule as you see fit. Terrorism has become a tool that irredentists and other ethno-nationalist groups use to do advance their objectives. All over the world, this new method is nothing new: Ethnic groups, who harbor a deep distrust of central governments, have vowed to make their countries ungovernable unless their wishes are met. States, however, don’t easily succumb to threats from these groups; hence, a broad framework has been established to isolate these groups that threaten the peace and stability of states. Rather than succumb to threats and tactics of these “ethno-nationalist separatist and irredentist groups, who are involved in “dangerous acts” designed “to influence the policy of a government by intimidation or coercion,” a government can classify such groups (or its members) as domestic terrorists (See 18 U.S.C. § 2331 or Patriot Act). In the United States for example, some anti-abortion activities may be categorized as an act of domestic terrorism. Pursuant to the United States Code, an organization that uses extreme violence can also be labeled a terrorist organization (it is one thing to believe that God doesn’t like abortion, but a different thing to threaten, or kill, abortion providers). Consider this terrorist organization—“Army of God (AOG), a Christian terrorist organization that has engaged in the use of anti-abortion violence in the United States to fight against abortion” (See Terrorist Organization Profile: Army of God. National Consortium for the Study of Terrorism and Responses to Terrorism). You have to understand that terrorism is a broad term, which experts have painstakingly categorized into sub-categories. In America, professors, who teach terrorism, give various definitions to help their students grasp the complexity of terrorism (Back at Duquesne University, Pittsburgh, for a whole semester, I studied terrorism under Professor John Sawicki, equally my professor of War and Peace in Nuclear Age). To most people, including learned (and smart) people who have not studied terrorism, they might think a typical terrorist will be someone like Osama Bin Laden, and that a typical terrorist organization will be Boko Haram or ISIS. That, based on my own training on terrorism, would be a falsehood. To experts and others who have studied this complex topic, terrorism can include “eco-terrorists and extreme animal rights,” in fact, “the FBI called eco-terrorists and extreme animal rights one of the most serious domestic terrorism threats in the U.S. today” (See “FBI – Using Intel Against Eco-Terrorists“). According to the U.S. Department of Homeland Security, “Animal Liberation Front (ALF) is a domestic terrorist organization” (See “What is domestic extremism?”, National Extremism Tactical Coordination Unit (NETCU)). Let me give you one more example, and I will move on: Do you think a political organization can be labeled a domestic terrorist organization? Yes. When Obama was the president, his appointees at the U.S. Department of Homeland Security and Federal Bureau of Investigations labeled Anti-Fascist Action (popularly known as ANIFA)— “grouping of autonomous far-left militant organizations”— as a domestic terrorist organization. Today, ANIFA are commonly known to disrupt political rallies, especially those rallies organized by the Republic party, all in the name of political resistance. 1. Secular left-wing groups (examples are Sendero Luminoso (SL: Shining Path) in Peru, Action Directe (AD: Direct Action) in France, Cellules Combattantes Communistes (CCC: Fighting Communist Cells) in Belgium, and Prima Linea (PL: Front Line) in Italy). 2. Ethno-nationalist separatist and irredentist groups (examples are the Palestine Liberation Organization (PLO), (PKK: Kurdistan Worker’s Party), Euskadi ta Askatasuna (ETA: Basque Fatherland and Freedom [now you can add IPOB, per the Buhari administration]). 3. Secular right-wing groups (examples are the Milliyetçilik Haraket Partisi (MHP: Nationalist Action Party) in Turkey, the Afrikaner Weerstandsbeweging (AWB: Afrikaner Resistance Movement) in South Africa, and the Minutemen in the U.S.). 4. Religious terrorist groups (examples are the Phineas Priesthood and the Covenant, the Sword, and the Arm of the Lord (CSA) in the U.S; al-Harakāt al-Muqāwwama al-Islāmīyya (HAMĀS: Islamic Resistance Movement); Aum Shinrikyō (Aum Supreme Truth) in Japan, and [Boko Haram in Nigeria].” (See What Is Terrorism? Jeffrey M. Bale, Middlebury Institute of International Studies at Monterey). In this article, I will focus on number 2—ethno-nationalist separatists and irredentist groups, for IPOB falls into that category, pursuant to the Buhari administration. With that basic understanding of terrorism, it is imperative that we understand how Western countries have defined terrorism, particularly the United States, Britain, and Canada. This definition helps to decipher whether a group fits under this definition of terrorism (by the way, these three countries share the same, or similar, view on terrorism): Pursuant to Canada’s Criminal Code, Section 83.01, terrorism is defined as an act committed: “In whole or in part of a political, religious, or ideological purpose, objective, or cause” with the intention of intimidating the public “…with regard to its security…including economic security, or compelling a person, a government or a domestic or an international organization to do or to refrain from doing any act” (See Canada’s Criminal Code, British Terrorism Act (2006), and Patriot Act). Also, this definition is no different than the one that the Buhari administration has adopted. When we analyze some activities of Indigenous People of Biafra (IPOB), we also have to talk about The Movement for the Actualization of the Sovereign State of Biafra (MASSOB). These two groups have different modus operandi. 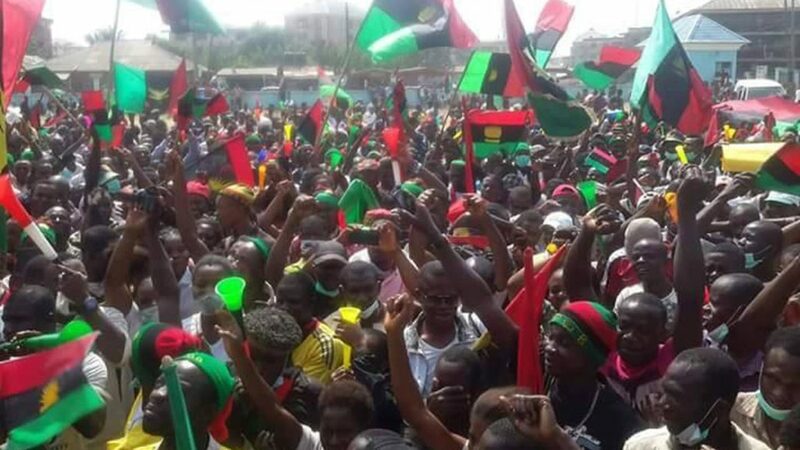 IPOB came on the scene to aggressively establish what MASSOB has failed to achieve (comparatively, you should think of The Palestine Liberation Organization (PLO) and Hamas. Hamas shared the same dream with PLO—to achieve a statehood—but it thought PLO was to idealistic, so Hamas aggressively challenged Israel). Akin, but Hamas achieved some victory against Israel and it also undermined PLO. Yes, but thousands of people also died and PLO still controls Palestine (and Hamas is now labeled as a terrorist organization by Israel and the United States). When some people talk about a peaceful recession, I can’t help but invoke this line: Some Nigerians play too much (you don’t secede by invoking the principle of morality, as most analysts have been doing, but by the principle of war). I know you appreciate people who want to tell you what you want to hear, but I was trained to extract my emotion from my analysis (in international relations, there are two basic school of thoughts—idealism and realism. Idealists (or Wilsonians) will continue to tell you how the principles of morality and rule of law are being consistently violated (what ought to be), but they’ve always misjudged the nature of the system, just like how Neville Chamberlain and Woodrow Wilson did, reality always expose their utopian views of the world. Another time-tested philosophy is the realism school of thought, which I belong: I respect the rule of law; I understand the principle of morality, but a state cannot look away when some fringe elements threaten its unity. If these fringe elements overpower the state, morality and rule of law will be hard to observe, for we would all have returned to the “state of nature, for life in the state of nature is “solitary, poor, nasty, brutish and short” (Chapter XIII. : Of the Natural Condition of Mankind As Concerning Their Felicity, and Misery.”. Leviathan). This was the same condition that Colonel Ojukwu brought on us, but we fought our way out (have you forgotten)? Some citizens of certain countries—South Sudan, Yemen, and Congo— currently live in the same volatile condition. In these countries, irredentists and warlords have taken over the affairs of the state. In the absence of a strong central government, citizens of these countries live in fear. In some sense, IPOB sees itself as a more vibrant, or charismatic, successor of MASSOB but, when one looks at how Kanu and his followers have conducted themselves, one cannot but said that they took a risky bet—they undermined the resolute and resolve of President Buhari to keep Nigeria intact. Additionally, they overestimated their strengths, a serious strategic blunder from a political standpoint. What am I talking about? Nigeria, regardless of its current political and economic turmoil, is still a strong militaristic state (think of Pakistan, a democratic state, but its military is its gatekeeper against India, a more powerful neighbor). Since 1960, the military has served as the last resort to prevent the disintegration of Nigeria (yes, some of its campaigns might fall outside the scope of international law, but the United States and other Western powers have always overlooked its excesses). For instance, when President Obama sanctioned the military for its brutal campaign against Boko Haram, President Trump lifted those sanctions and sold more weapons to the Nigerian military. Furthermore, there is a joint agreement between our military and the Californian National Guard (some top officers came to the United States as recently as August 2017. I missed my appointment with them by a few hours, for they had visited my boss’ boss, General Vadnais, during a military training exercise in Michigan). My point is this: The military sees itself as the gatekeeper of our country and, if directed by any president, the military will comply. President Goodluck Jonathan, from the Ijaw ethnic group, ordered the military to carry out massive military campaigns in northeastern Nigeria, the military complied (we all know that those areas were and are still being devastated). President Obasanjo, from the Yoruba ethnic group, ordered the military to carry out massive military campaigns in Odi in Bayelsa State, the military complied. Let’s stop ethnicizing everything that has to do with Nigeria. President Buhari, from the Hausa ethnic group, has ordered the military to carry out a surgical training exercise in Aba, Abia, and the military is complying (by the way, Buhari also ordered the military to deliver a serious blow to Boko Haram in northeastern Nigeria). Look, the affairs of a state are always messy; the military does the dirty job for politicians, anywhere in the world. President Buhari is not callous; he is doing what Western leaders (or those you called civilized people) would have done, if presented with the same situation (look, we don’t have a National Guard in Nigeria, and The Nigerian Police Force is ill-prepared to carry out this task, so the military has traditionally carried out some of these roles. It is falsehood to allege that soldiers don’t invade American streets, for some tactical gears used by our local American police officer are better than what Nigerian soldiers use). Kanu made a strategic blunder by invoking vitriolic attacks against other ethnic groups and the federal government of Nigeria (I can call Donald Trump a stupid man, but I can’t threaten his life, and I can’t threaten my fellow citizens’ lives—FBI will knock on my door. I understand the First Amendment to the United States Constitution and I also understand that free speech should be extended to both political expressions and freedom of expression; however, once free speech rises to the level of fighting words or hate speech, it is not protected under the First Amendment: Per hate speech (or fighting words), their content embodies a particularly intolerable (and socially unnecessary) mode of expressing whatever idea the speaker wishes to convey” (See R.A.V. v. City of St. Paul, 505 U.S. 377 (1992)). Kanu, before “Operation Python Dance,” was not preaching like Ghandi, but he was speaking like someone who was ready to go toe to toe with the federal government: He kept raining insults on other ethnic groups; the pressure kept building without no abatement. At one point, he vowed to visit Lagos, but some Lagosians drew the red line—Lagos is not Aba (you will be annihilated in Lagos, they warned); he retreated. At the time, people were cheering Kanu on Facebook; his strength grew. Have you forgotten? If you are a serious analyst, you have to take a retrospective look on this matter. We didn’t get here by accident. Some people have underestimated how influential Kanu had become (they called him so many sweet names; you would think they are romantically involved with this man), but they have forgotten to mention that Kanu had loyal supporters who carried out his destructive instructions. The writing was on the wall, but some observers failed to see it; however, military intelligence revealed to Buhari (when he returned from London) showed that IPOB and Kanu were becoming a clear and present danger to the peace and stability of Nigeria. In my own opinion, President Buhari wanted to first throw an idealistic approach at this hot topic so, in his first major speech upon his return from London, he dedicated the entire speech to the issue of secession and unity (i.e., national security): President Buhari was abundantly clear—“Nigeria’s unity non-negotiable.” People were so furious, but not curious (how can he focus on national security, they asked)? The next day, I analyze his speech: I called it the best speech of his presidency. And some apolitical people thought I was crazy (they called me delusional). I laughed, for they (political neophytes) never understood how political leaders think. I was not trained to understand “feel-good” messages, but I was trained to analyze ambiguous messages, for politicians don’t tell you exactly what they will do (you have to be an expert to understand the underlying message(s)). From reading and watching that speech, I got the impression that President Buhari was extending an olive branch to Kanu and others, but Kanu thought Buhari was too weak to do anything: That turned out to be a mirage, for the General was back (the “rats” affair caused commotion, for it painted a weak government, but that wasn’t the case. Kanu took the “rats” joke too far—he thought Buhari was a weak president). The question on everybody’s mind should have been this: Why did it take the government so long to curtail Kanu’s incitement? Well, you know the answer (President Buhari probably struggled with this decision). But, once Kanu wouldn’t hold back, he gave Buhari no choice (I am sure that the military has a folder that contains all those videos of Kanu inciting his men to “burn down the country”). It wasn’t a rhetoric (he claimed to have a “secret unit). He was propagandizing all along, until the Army took him seriously, which exposed Kanu’s puffery. By classifying Kanu as a terrorist organization, it helps the government to delegitimize Kanu’s ambition; in fact, Washington and Downing Street will likely give President Buhari some leeway to stabilize Nigeria. Concerning President Obasanjo’s admonition, the former president doesn’t have any credibility on this matter (he would have done the same thing; in fact, he would have acted before now). There is only one president at a time, and that is President Buhari (When Obama counsels Trump, does he listen? When Bush tried to talk Obama out of the CIA waterboarding program, did Obama listen? No). If you are not the president, you’ve no moral, or ethical, obligation, to keep Nigeria intact (ko ni ti ori mi baje—Buhari won’t let this country disintegrate before his eyes). Have you looked up the definition of Python lately? “Python is a genus of nonvenomous pythons.” What of “venomous”? According to the Oxford dictionary, it means (“of a person or their behavior) full of malice or spite. Here, we are dealing with “nonvenmous,” though: So the military didn’t come to show malice, or spite, but Kanu took the bait, which gave the military an excuse to change their mission; hence, the declaration of IPOB as a terrorist organization, which is consistent with the definition of domestic terrorism, under both customary law and international law. Now, for those supporting Kanu, don’t be so stupid to call yourself a terrorist on Facebook, for you are digging a hole for yourself (if America needs the vote of Nigeria at the United Nations, and it wants Nigeria to support her, in return, the Buhari administration can lobby the United States to add IPOB to its broad list of terrorist organizations). And, regardless of your intent, you will likely be labeled a member of a terrorist organization (if you already live in America, and you are going to apply for a Green Card, stay away from this hot button issue, for it might hurt you). In the future, you don’t want to pay me thousands of dollars to argue your case before an immigration judge. Finally, we should start asking for experts’ opinions, not just general opinions from pseudo “Facebook experts” who are too emotional to understand some of these nuances (when you watch CNN, they have different experts on different areas; in Nigeria, once a jobless graduate of business administration starts blogging on Facebook, he is deemed an expert in weapon proliferation or ballistic missiles). Just like you would trust your dentist, not me, as to how to remove a painful tooth, stop trusting emotional analysts (start trusting the right people). On the surface, politics might look simple but, when you take a basic survey course in political science, you will understand that politics is a tree with different branches.